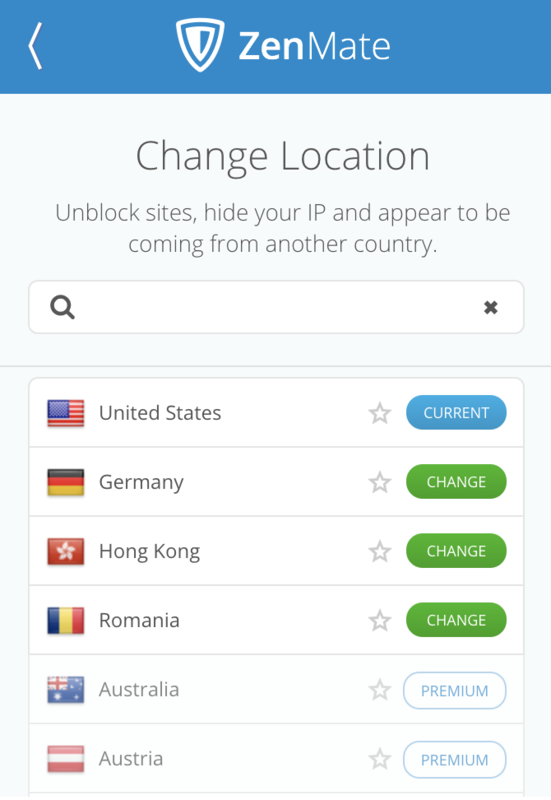 In case you are looking for a tool which will help overcome geo restrictions or you just need to hide your location. ZenMate Free VPN will be great for you. In case you are seeking for more privacy and encryption of all your internet connection, including other apps than your browser. You should rather get a desktop based VPN solution. Beside this add-on, they also offer standard VPN solution which comes with 7-day ZenMate VPN Free Trial. 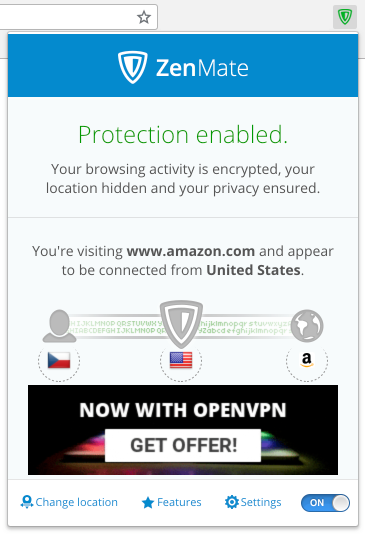 Keep in mind that this is not a real VPN application and it won’t encrypt completely your bandwidth (e.g. BitTorrent, games, FTP client) to do so you have to download Free VPN client or buy a VPN service. ZenMate VPN for Chrome is 100% free solution with no data limit . On the other hand, you are going to be limited by number of available servers and some advanced features will be locked. That could be bypass with a premium account which starts at $7.99 per month ($4.99 per month if you buy a 1-year license). 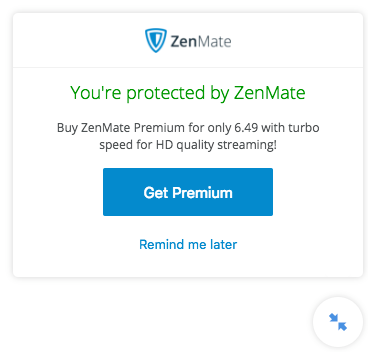 Pricing & Discounts – How much does ZenMate VPN cost? As we mentioned earlier, the Chrome Add-on version is for Free, without any data streaming restrictions. If you decide to purchase premium account, the 1-month plan starts at $7.99 per month. Anyway by choosing a 1-year plan for $59.99 you are going to save almost $36! All purchases come with the 14-day money-back guarantee. If you are not happy you can cancel the subscription and get the full amount back – no questions asked. The time range is a little bit strange, cause vast majority of VPN providers offer 30-day money-back guarantee. That basically became a standard for software segment, including VPN providers. User Interface – Is ZenMate for Chrome easy to use? In a nutshell – yes. In the main dashboard you have the option to switch on/off the encrypted connection. Anyway needs to be said that the button might have been more visible and definitely bigger as we are used to from other VPN clients. You are able to see right away what server you are using and options to change location and adjust your settings. The overall design is not really well polished and also UX wise, we would definitely tweak a layout a bit. But overall, you are able to the basic stuff quickly without any major slowdown. What we really don’t like is the pre-enabled SmartPrice Feature! This might be good for someone who is seeking lower prices when buying stuff e.g. on Amazon. But since the user experience, while browsing those kind of stores, is disturbed, you should let the users decide, if they want to use it or not, from the very beginning. At least you can easily turn it off in Settings in the bottom of the list, where you need to just switch off this feature. On top of having banner with Ads in the main dashboard, be prepared that time to time they will offer you a premium solution inside the browser in the bottom left corner of your browser. That is annoying but on the other hand understandable. Since this is a Free Solution which as other comes with some kind of advertising. What features does ZenMate for Chrome offer? There are several great features build in the Free version which worth to mention. ✅ WebRTC protection [Available in free version] – This feature will ensure that your IP address will not be revealed online. ✅ Smart Location [Available in free version] – You can customize how ZenMate connects to your favourite website by automatically switching locations when you visit them. ❌ Malware Blocking [Paid version only] – Enable blocking of malicious sites before they can reach your browser. ❌ Tracking Protection [Paid version only] – Protects your from 3rd party services to track and collect information about you. Rest of 30+ locations are accessible only in paid version. Does ZenMate for Chrome Unblock YouTube, Netflix, Hulu, HBO GO, Amazon Prime, & BBC iPlayer? During our testing, ZenMate worked well with YouTube, Google, and Facebook. Unfortunately, we have not been able to connect to Netflix and Hulu. The same problem we had with BBC iPlayer but that wasn’t a big surprise since BBC iPlayer blocks nearly all VPN services, except HideMyAss VPN which recently even announced new feature IP Stickinees for Improved Netflix and BBC iPlayer streaming. ZenMate Security & Privacy – What kind of information is ZenMate Free VPN collecting? How to add ZenMate Free VPN to Chrome Browser? Adding ZenMate to your Google Chrome Browser is really is, all you need to do is follow these 3 simple steps below. Go to ZenMate VPN Chrome Store page and click the button “ADD TO CHROME” in right upper corner of the overlay window. Here comes the part we do not really like. You have to register an account to be able to use their service. In case you are looking for a tool which will help overcome geo restrictions or you just need to hide your location. This tool will be great for you. In case you are seeking for more privacy and encryption of all your internet connection, including other apps than your browser. You should rather check our comparison of Best VPN solutions out there.